This is a picture of my path. An actual path, that you can stroll on. I built it last year around this time. Well, perhaps build is too strong a word. I placed the pavers on the ground in a way that pleased me, then filled in around them with bark and ground cover. Later I planted perennials and grasses. All with a lot of help from my husband. For years I yearned for a garden path. I have a file folder filled with ragged-edged images, torn from magazines. And almost every article on path-making said the same thing: a meandering path is best, one that at once slows people down and pulls them forward to the next discovery. At first I wondered if my path was too uncluttered, too easy to traverse. I needn’t have worried however. Because now, a year later, it’s filled in and there’s plenty to discover there. Lavender. Rosemary. Catmint. Blue Fescue. Society Garlic. Salvia. Wooly Thyme. Orange Carex. Diascia. Waiting to be appreciated, until it’s time to take the next tentative step and decide which way to go. To the left or right of the rosemary that’s spilling onto the pavers? Behind or in front of the salvia? Walk around or on the wooly thyme? Reminding me, again, that traveling the path through my garden is a lot like traveling the path through my life. And that almost all of my most profound life lessons come from nature. How about you? What’s on your path these days? For the next two weeks I’ll be doing some wandering on my path, literally and figuratively. I’ll come back and tell you all about it on June 6th. In the meantime, I welcome your comments and thoughts. Although I’ll be unplugged part of the time, I’ll be around too. And I will read and respond to all of your wise words. I had my entire path all laid out too at one stage in my life. Then I fell off. Literally. I’ve learned that we have the most amazing capacity to build a new path, step-by-step. If we want to. Beautifully said, Tracy. Thank you! Wow, that’s a nice bit of serendipity. Thanks so much for sharing that quote. Mmm, I’m smiling too Belinda at the thought of both of us meandering, separate but somehow linked, as all human beings are. What’s on my path these days? It seems like it’s filled with family, friends and travel. I’m going to meet Caroline from No Wordz Photography in CA tomorrow and she’s going to do a photo shoot and make a new header for my blog. Then the weekend we’re going to GA to stay with my daughter for the long weekend. I’ve trimmed my lavender plants and they’re bloomin’ again. Kinda like my life?!? I love your path and all the herbs you mentioned. I’m currently taking in the smell! Oh yes, I love that about lavender, Tess. And it sounds like your path is chock full of delights these days. I write about nature a lot – and I think I’ve just realized in the past week or two how powerful that is. How much there is to learn from Mother Nature. And the reason behind it, that being in nature helps me feel grounded, to reconnect to my roots and my identity away from the pressures of society. Enjoy your time away, Patty! I can’t wait to read what insights you bring back. I love it when you write about nature, Eva. It always touches me. what a beautiful path! I love that you planned it out one way and it has filled in with lovely treasures all on its own. That’s the best about unfolding! On my immediate path is picking up my children from school and enjoying this beautiful sunny afternoon together:)Forget about chores and go play for a bit! Yes, isn’t that cool how that works out, Joy? In life and in gardening? And it’s wonderful to hear that you decided to drop the chores and concentrate on play. Meandering is all I’ve ever been able to do. I get bored very easily, so I often find that I must wander far and wide in life to find the next small piece of inspiration. I get bored easily too, Tony, so we’re on the same page. But I kind of like it because like you say, it sure does lead to unexpected inspirations. “Daffodils” is one of my all-time favorites indeed, and I enjoyed your reading of it! So, always longing to lead someone down the garden path? Hmm. LOL. Actually, I am terrifically fond of such places, and yours is beautiful, all the moreso because you created it. I like my back yard, which is full of mulberry trees. Bosco likes it too, and so there you have it; our little patch of paradise. Thank you, Shay! That’s high praise indeed coming from a great poet like you. And now I’m just imagining you in that little patch of paradise. Very wise, Dorothy. So true that the path unfolds when we let go rather than cling to it. Hi Tisha – Welcome, and thanks for stopping by. Love your gardening metaphors. I’m so looking forward to being outside this summer too, and I’m trying to figure out all the things I could actually do outside. I read an article last year about a writer who spent almost all of her day outside in her garden, and it was quite inspiring. You have created a lovely path. I love the quote, so very true! What a great concise lesson. Loved the reading of the poem. Thanks for sharing. Thank you, Mark. Such kind words! I love paths, mainly the unbeaten ones. Lots of room to stretch and grow. They provide adventure and excitement. As Joseph Campbell says, I’m building my path with each bold step. Am on a new path teaching an enjoyable on-line essay writing class that’s lots of fun. It’s a great way to find one’s life purpose! You are SUCH an adventurer, Giulietta! I love that about you, and can just imagine you romping on that unbeaten path. I have no idea what my path is at the moment, we are on the move again soon. I do want to peep sometimes where it is going but knowing I can’t I make sure I look where I am at right now. As that is great as well, I do not mind that I cannot see ahead. Lucky me because I would not know how I would feel when what I saw today was not as good as it is. But then I am actually quite easy to please, lucky me again. Absolutely, that’s the best kind of path. We are tempted to peak around the next curve, and yet, there’s that lovely bit of greenery that’s mesmerizing us right where we are. Hugs to you, Wilma. My path disappears into fog or rays of sunlight or around corners most of the time while other times I can glimpse a little of it just there, around the bend. That glimpse is more a vague impression as the details are yet to materialize. Monday, after dropping my daughter at school I found myself knee deep in a mud puddle where a sidewalk was the previous Friday. So much for those sandals! I was able to pull one shoe out attached to my foot while the other…well, I had to pull that one out with my hand after my foot emerged covered in mud. The path… it unfolds as I go and I honestly have no idea what turns it will take or what I will experience along the way. I trust though that I will smile, laugh, sing, and delight in the details as they appear. You made me laugh with your delightful writing about your path! Thanks for that. My path is just allowing, watching, releasing resistance as it comes up. It seems there is no end to releasing. You’re path is lovely–love the fescue in particular. Happy meandering! Ah, releasing. So true about paths in the garden and paths through life, I think. Thanks for sharing your path, and enjoy your wandering. What’s on my path? Literally dandelions and broken concrete. Metaphorically, my path is learning to trust myself and explore what is possible when I do. It is a fascinating journey to take and I never know where it will head next (including a few detours). I have an idea where i’d like to end up, however that will change! That’s so wonderfully put, Phil. And I love the image of dandelions and broken concrete. I am always watching and observing the unfolding of Nature’s day in my garden. I don’t really have a garden path. I haven’t thought about it before, but it is something I might consider. I’ve always wanted to have a wild flower garden in the back and it would perfect to have a path wandering out to it. BTW — I liked your reading of the Wadsworth poem. It is nice to hear your voice! “Walking without any specific destination in mind” sounds delightful, Sara. And I’ve always wanted a garden of wildflowers too! 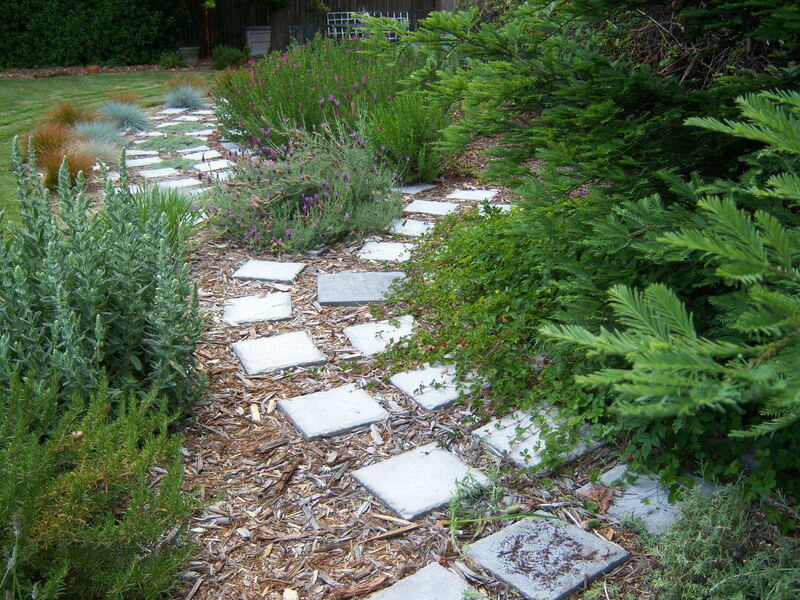 Thanks for this — I like the image of you just laying the stones and then allowing whatever grows in the surrounding area to relate to the path in any way it chooses. What a great metaphor for an adventuresome life. Patty, I LOVE paths. Paths through gardens, forests, anywhere. When I’m out wandering and I see a path I always have the urge to follow it. Paths do beckon. And, so does nature. What is on my path? Just little ol me. I’m content. So nice to find a fellow path-lover, Davina. Someday we must have a conversation about our mutual fascination with paths! Enjoy you sharing these thoughts on your path. In particular, your initial concern about it being too uncluttered or easy caught my eye. I think that often, we think that to be of value, our path must involve struggle and difficulty. I don’t believe that’s the case and I think your story supports that point of view. You laid out your path in a way that made you happy, took some simple steps to ensure its further development (planting) and let go. Nature did the work (effortlessly, as is its nature) and your path and the happiness it generates was enhanced. In summary, I believe that as long as the path I’m on brings me happiness and as long as I am taking steps to make me even more happy in the future (planting the right seeds), the rest will sort itself out — no need to struggle or worry! How very insightful! Yes, I did wonder if I had planted enough in it, but as you say, nature did the work. And the more I’m in the garden, the more I learn to trust that effortlessness of nature. (And in turn learn to be patient). Thanks. I love what Don Juan said about traveling the path. I don’t have the exact words with me (they’re at home), but funny I was planning to do a post on it. He says the only path worth traveling is the path of heart. And that when we examine a path the question we need to ask ourselves is whether a path has heart. If so, traverse its full length. I love it. But then, I always have been a heart sort. Well, Lauren, you’ve certainly captured my heart by channeling Don Juan. I’ve got a big smile on my face. Thanks! I used to have a set path, a clear idea of where I was going. Now it’s one step at a time as you so cleverly put it. I have no idea where I’m going but as long as I’m stepping with love and faith, it’s worth the journey. I love your picture. It’s a meditation just looking at it. I love that sense of awareness you bring to it, Maryse – stepping with love and faith. I don’t think any of us can go wrong when we do that. Why such a hard question? I plan things in minute detail but I’m beginning to think that I don’t have a path. Good thing is… it doesn’t bother me. Perhaps because I’m content, I’m prepared to try a few alternative routes and choose the one that I like best. Sounds like the planning is balanced out with a good bit of experimentation, Keith. Love the sound of that. Pingback: Meaning Mondays: Between Gratitude and Grief Edition « Why Not Start Now? First, thoughts coming your way re: you and your precious cat. I love the Joseph Campbell quote. He has another one of my favorites: Follow Your Bliss. And he did. There’s a photo of him from Esalen in his later years, surrounded by friends, and radiantly shining. Recently I pulled out a quote from Carlos Casteneda (Don Juan) that talks about a path with heart. This gist is the only path worth traveling is a path with heart and there I traverse its full length breathlessly…something to that effect. My hope and sense is that I am traveling a path with heart. It’s clear to see you are too! Hi Lauren – Thanks so much for stopping back in. I love the idea of a path with heart. And Joseph Campbell was amazing, wasn’t he? I would have loved to have hung out with him at Esalen. What a kick that would have been!